When I learned beekeeping, back in the day, I had classes 2 times a week and regular visits to the apiary to implement what we were learning. Over the years, I found that the best way to get people to “keep doing it” it to build their confidence about their own capabilities. Most people that attend the short beekeeping courses never actually get into beekeeping, which is very sad. And of those that do, many of them will find bees very complicated, something will go wrong and will quit at the first sign of a problem. The result is thousands of dollars going to the trash, high levels of disappointment and no new knowledge for the now ex-beekeeper. When you join our Beekeeping workshop, you will become a beekeeper by learning and doing side by side with us. 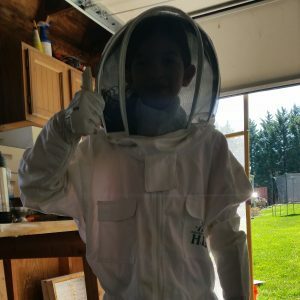 I will provide you the tools, the equipment, and the bees, so you don’t have to invest money on getting started before you are sure of what you are doing. You will do everything we do year round, with direct supervision, encouraging and nurturing, so you are sure that you can repeat it at home on your own. We will also try what most people consider advanced techniques, like queen rearing, chunk honey production, etc. We will do nucs and see them through the winter, feeding, disease control, harvesting, packing, cleaning, etc. This is a unique educational experience, and not available from any other source. There is a annual fee to participate, and family discounts for siblings or parent/child teams. You can join at any time, yet we recommend to start in the winter (February), as it is the start of our beekeeping year. Things get changing really fast after spring shows up and you want to be ready. Are you ready to join? Just let us know, you can contact us by email through our contact page or give us a call at 240 899 4094. We can answer all your questions and get you started right away. Duration: 1 year. Cost: $1999. A one-hour presentation for your school, group or association about bees, beekeeping and other related subjects. Come and visit our farm and spend up to two hours learning what we do, how we do it and why Urban Farming is so important. For up to 2 hours you can learn about raising chickens, growing vegetables and keeping bees. There is plenty of opportunity to ask questions and the content is delivered at age appropriate levels to make it fun for everyone. Suit up and dive into a hive with us. We will show you the inside of a bee colony, explain everything you see and take you through an amazing journey that will leave you awed. Bee hives are an incredible ecosystem and an example of social organization like no other, and now you have the chance to see it up close. Learn everything you will need to start your backyard beekeeper hobby. For 16 hours (3 days) we discuss equipment, management and caring of beehives. Upon completion you will be on track to enter the most amazing hobby you will ever find! This is an intensive program for ages 11 and up. Participation on this course provides you, in addition to the training and book; 1 hour on-site support to install your nucs into your hive equipment and free access to the members only discussion board where we answer questions and provide guidance through the year. Practical beekeeping goes an step further than our Introduction to Beekeeping Course (Beekeeping Fast Track) as the whole training is at the yard with the bees. You are required to have taken an Intro class from us or from a local club and have the equipment required to work on the hives. In this program we will make nucs and/or divides, install them, inspect them and care for the bees while we discuss management techniques, a detailed calendar for the year, harvesting equipment and methodologies, basic queen rearing and more. The class meets 4 Sundays in April and May for 4 hours each day.